This monument is not only interesting because of its grandeur, but it is also a gem for a family historian because of the information engraved on the stone. The information provides pointers for finding more records and information. Just because the information is engraved in stone, it may not be 100% correct. 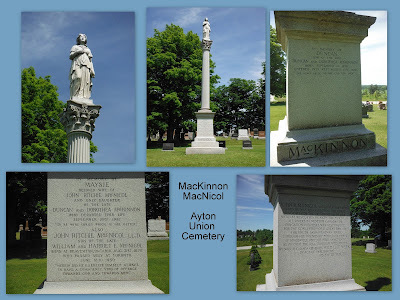 The monument is found at the Ayton Union Cemetery, Ayton, Grey County, Ontario. "To be with Christ is far better"
towards God and towards men"
On one side is a long description of the work of John. On another side Maysie's brother, Duncan, is remembered. "He shall abide before God for ever." Maysie was born according to her death registration 8 August 1878. She taught school until she married John MacNicol. According to John's birth registration, he was born in Thorah Township, 31 August 1877. This is one year earlier than the date on the monument. John taught school at SS #9 Normanby. They moved to Toronto. John and Maysie were married 6 January 1915 in Toronto. At the time of their marriage, John was listed as a manager. When she became ill in February 1932, Maysie left her home in Toronto and returned to the family farm. She died 22 September 1932. She was 54 years old. The funeral was held at the farm and it is reported 500 were in attendance. Her husband used part of her estate to erect a monument that he imported from Portugal and the cost is said to have been $15,000. John was a member of Parliament for 20 years. He was a great advocate for the preservation of natural resources as mentioned on the monument. Maysie MacKinnon Ontario death registration #016452 (26 September 1932), digital image, Ancestry.ca, citing MS 935 Reel 441, Archives of Ontario, Toronto. Maysie MacKinnon -- John R. McNicol Ontario marriage registration #019106 (19 January 1918 - date received by Receiver General); digital image, Ancestry.ca, citing MS 932 Reel 359, Archives of Ontario, Toronto. John Richard MacNichol [sic] Ontario death registration #020643 (31 December 1877); digital image, Ancestry.ca, citing MS 929 Reel 29. Normanby Reflections, Vol. 1. MacKinnon and MacNicol sections.